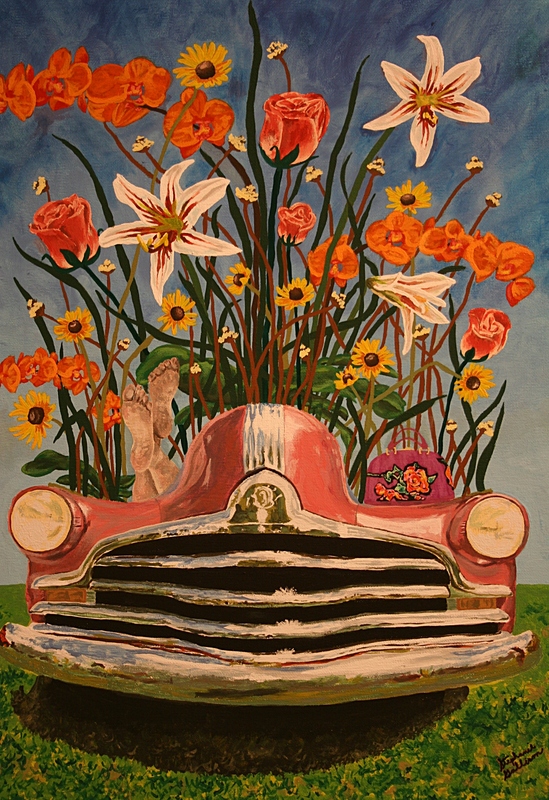 “Flower Car for a Living Detroit,” acrylic on canvas by Michigan artist Stephanie Gallison and part of the car pARTS exhibit at the Paradise Center for the Arts. The painting “represents life, hope and resurrection for the city of Detroit; the opposite of recession, decline and decay,” according to Gallison’s website. IF YOU’VE FOLLOWED this blog for awhile, you know that I’m a supporter of the arts. And I don’t specifically mean I write out generous checks to buy art or donate to an arts cause or such. I wish I could. But the fact is that my family, like many middle class families, needs to watch its budget. That doesn’t mean, though, that my husband and I can’t treat ourselves to the occasional night out to see a play or enjoy a concert or catch a comedy show, or become members of the local arts center. A snippet of the current car pARTS exhibit at the Paradise. I appreciate that we have the Paradise Center for the Arts right here in Faribault as a venue to enjoy the visual and performing arts and even take a class, if I wish, but haven’t. Perhaps because I grew up in the 1960s and 1970s in rural southwestern Minnesota, without access to the arts, I especially value the arts opportunities offered right here in my community, only blocks from my home. No need to drive up to the Cities or elsewhere. 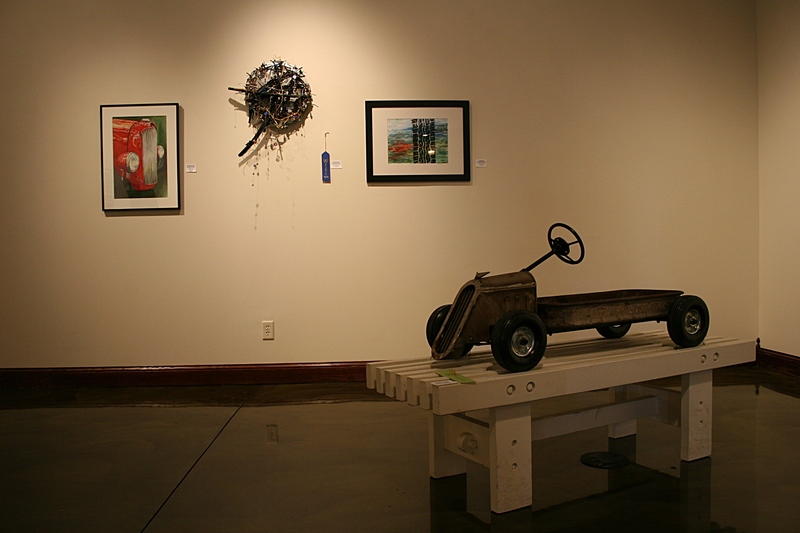 For example, currently the juried exhibit, “car pARTS,” is showing in the PCA’s Carlander Family Gallery through September 25. 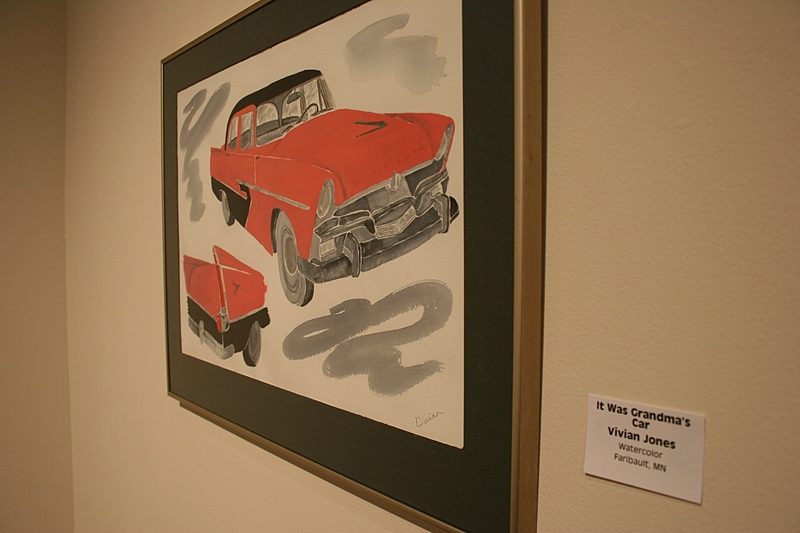 The show is exactly as it name implies, artwork featuring cars or parts of cars. 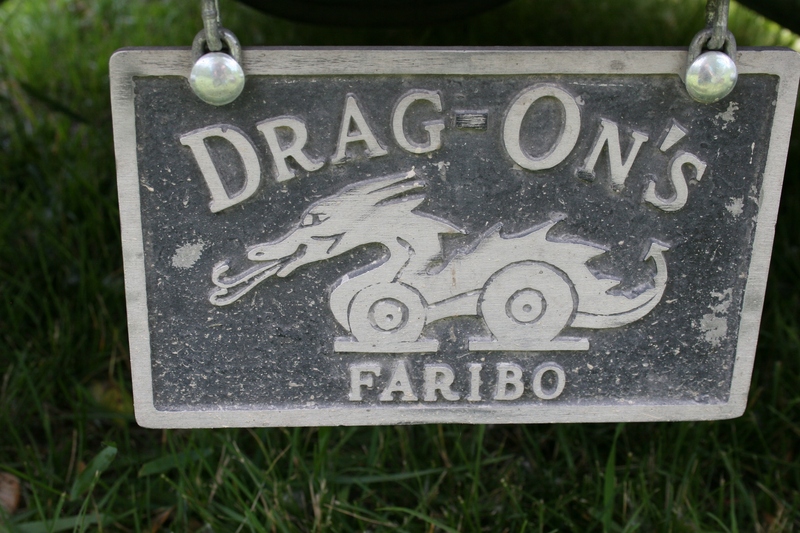 The logo for the Faribo Drag-On’s Car Club. Hanging out along Central Avenue during Faribault Car Cruise Night in May. The subject seems an ideal one for this predominantly blue collar community which has a special fascination with cars. That’s my assessment, anyway, based on the long-standing Faribo Drag-On’s Car Club, the Classic Car Roll In on Tuesday evenings at the Country Kitchen and the recent start-up of the May-September third Friday of the month Faribault Car Cruise Night on downtown’s Central Avenue. Following the car theme, the Paradise Community Theater will present six performances of the play, The Car by Carol Wright Krause, beginning September 14 and running through September 22. 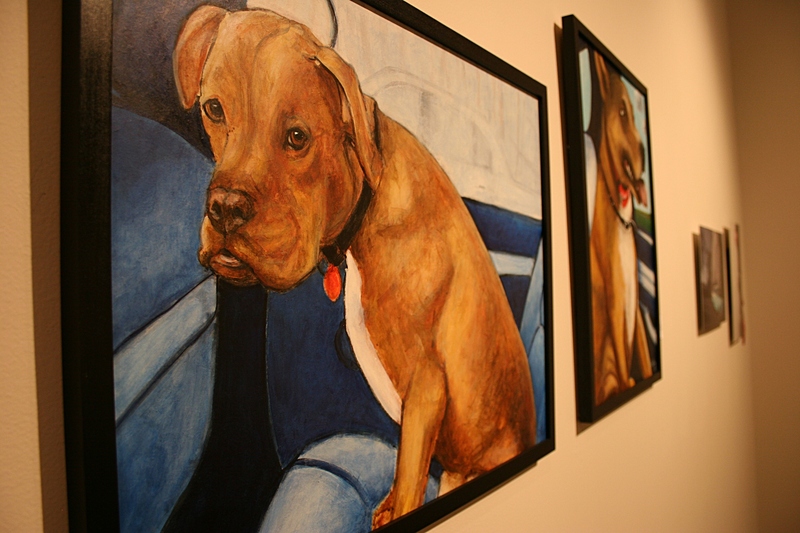 Acrylic paintings of dogs in cars, by Julie M. Fakler of Faribault , are in the car pARTS exhibit. The play seems the ideal mesh with “car pARTS,” one complementing the other. Meet the Banners, a picture perfect postcard of a 1950s American family with an all-American son, a doting mother and an honest car salesman of a father, who does everything by the book and has just recently purchased the car—a 1954 Hudson Hornet. But when their son suddenly joins the military, only to return with a Japanese wife, the family’s world is suddenly turned upside down. Things may not be as picture perfect as they seem. The Car hits a few potholes along the way, takes some sharp turns, but takes you on an engaging and entertaining ride. 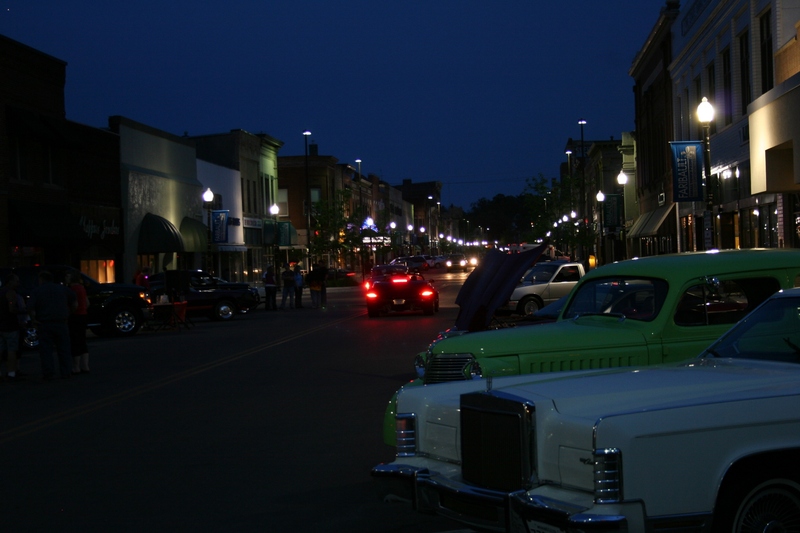 Looking south on Central Avenue during the Faribault Car Cruise Night in May. 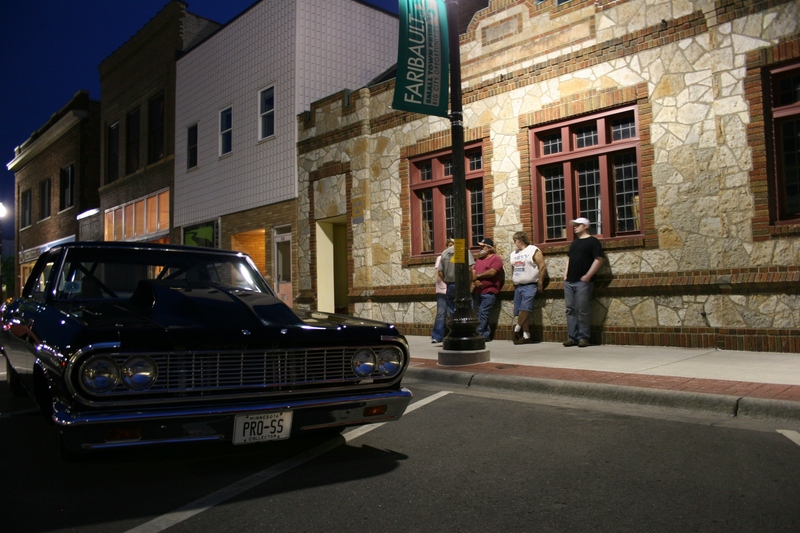 I’d love to see all those collectors who are members of the Drag-On’s and/or all those who will be participating in the last downtown car cruise of the season on Friday, September 21, among those attending The Car in Faribault’s historic theater. 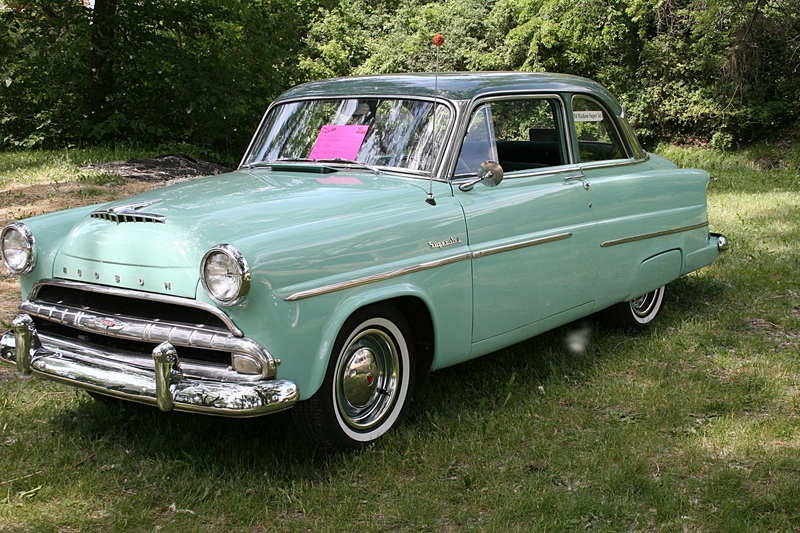 I invite any of you with vintage vehicles, whether from Faribault or not, to drive to the theater in your vintage vehicles, park along historic Central Avenue and experience the arts scene here. Maybe even dress up in back to the 50s garb to truly embrace the time period of the play. Do you know who owns this Hudson Super Jet? 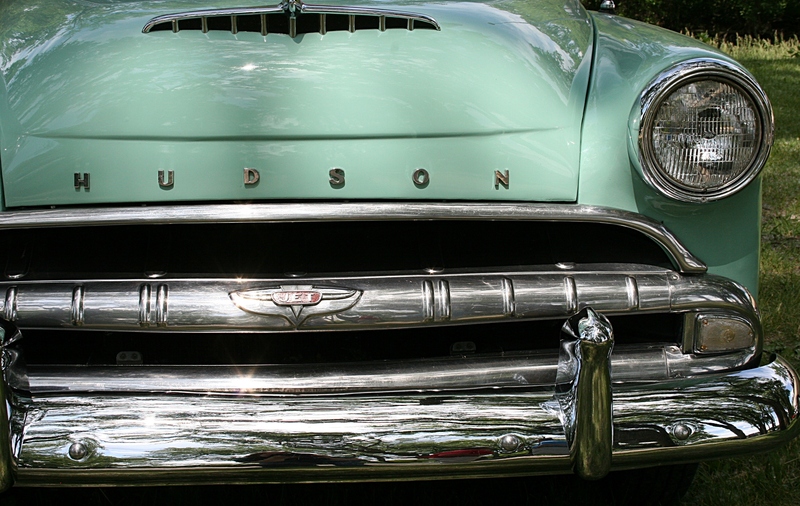 And whoever owns this Hudson Super Jet, which I photographed at a car show in TeePee Tonka Park in 2009, you’d be especially welcome given the car in the play is a 1954 Hudson Hornet. Just a close-up of the Hudson Super Jet, built either in 1953 or 1954, I believe. FYI: Click here for more information about the Paradise Community Theater’s performance of The Car. P.S. This additional postscript has nothing to do with the arts in Faribault. But it is related to my support of the arts via my work on Minnesota Prairie Roots. Earlier this week I posted about the Gabor and Edith Nemeth Study Collection, a priceless collection of 15th to 19th century paintings in Park Rapids. The Nemeth Art Center is attempting to raise $1,200 for a storage unit to safely store and protect the paintings. Since posting this story on Monday, five more contributions have been made to the cause via the NAC’s online fundraising campaign, which you can find by clicking here. You have four more days to donate. To read my original post about the Gabor and Edith Nemeth Study Collection, click here. 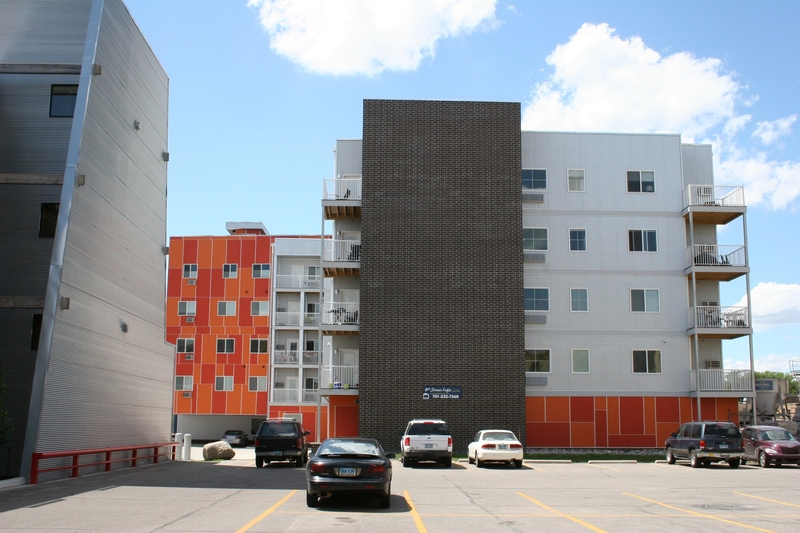 The 8th Street Lofts in downtown Fargo house apartments ranging in size from 465 to 1,445 square feet and renting for $560 – $1,800 a month, according to the Loft website. The rectangles of tangerine orange bursting in brilliant shades next to monotone gray walls set against the complementary soft blue of a summer afternoon sky caused me to pause, mouth agape. Would you expect this in Fargo? Maybe along an ocean beachfront in Florida or California. But North Dakota? That just goes to show that any preconceived notions of what buildings belong where can be proven wrong when you happen upon an architectural anomaly like this structure housing 8th Street Lofts. Honestly, in the bone-chilling cold of a sub-zero, wind-flogging January morning, wouldn’t this cheery color cause you to smile? It would me. 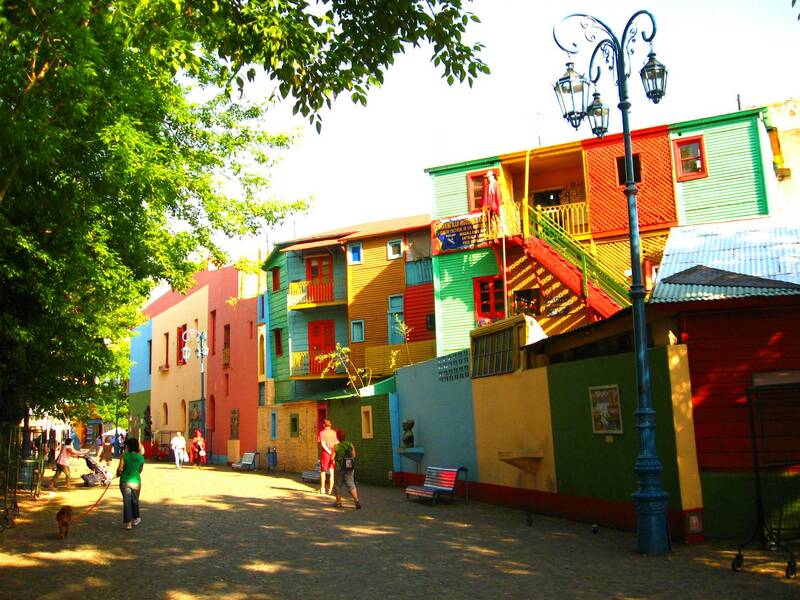 You’ll find brightly-colored buildings in the La Boca neighborhood of Buenos Aires, Argentina. Although primarily a tourist destination today, the area is surrounded by houses with painted sheet walls of different colors. Photo by Miranda Helbling. The jolting orange shades remind me of the multi-colored buildings photographed by my second daughter in the La Boca barrio of Buenos Aires, Argentina. That rough, working class neighborhood along the banks of the Riachuelo River draws tourists to view the colorful houses built by the early Italian immigrants from cast-off ship building materials—planks, sheet metal and such—and then, as legend goes, painted with left-over paint. I expect when my daughter saw those jolts-of-color buildings, she, too, stopped, mouth agape. She failed to tell me, though, that the La Boca neighborhood is a rather dangerous place, especially at night. That figures given street criminals are drawn to tourists. I wouldn’t expect the same in Fargo. I GREW UP WITH DIRT under my fingernails, banishing weeds from the garden and then, later, harvesting and preparing veggies to eat fresh or preserve. My mom canned some, froze some, storing away freezer boxes plump with green beans and beets, corn and other vegetables. She also preserved fruit in quart jars, with the assistance of us kids, for the long Minnesota winter ahead. Applesauce and cherries. Peaches and pears. A juicy Colorado peach, from which I must remove the skin because I can’t tolerate the fuzz (feels like a cotton ball) in my mouth. And then, on a brisk winter evening, when Dad was about to come in for supper after finishing barn chores, she would lift the trap door in the kitchen and send one of us clomping down the creaky, rugged wooden steps to the dirt-floored cellar for a jar of sauce. Dessert. I would tug on the frayed cotton string to switch on the single bare light bulb. Then I would tiptoe reach for a jar of my favorite cherries or peaches. 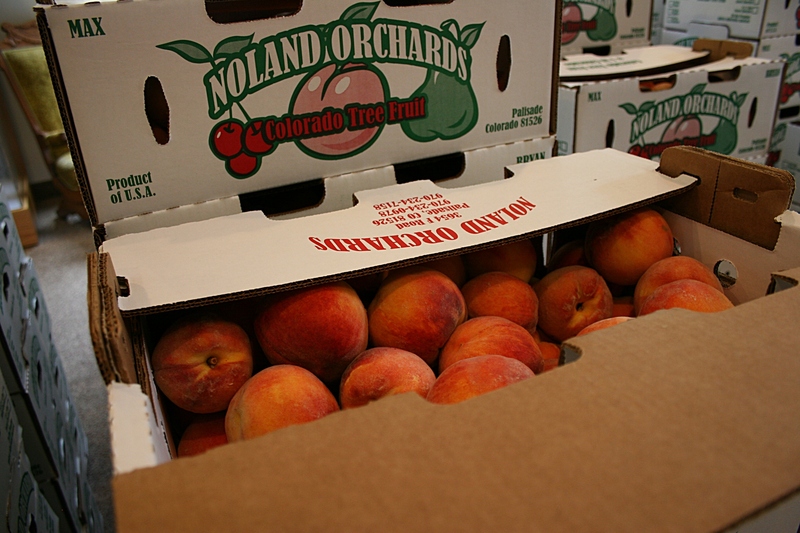 We got a single box of freshly-picked Colorado peaches. When I was growing up, the peaches came in a wood-slat box that was nailed shut. Each peach was wrapped in tissue paper, which we recycled for use in the outhouse. Those were my thoughts on Saturday when my husband and I picked up a 20-pound crate of peaches I’d ordered several weeks ago through the Cathedral Community Cafe, a Faribault soup kitchen which every Tuesday offers a free meal to those in need and/or seeking fellowship. It is a worthy cause with some 9,000 dinners served in 2011 and averaging 150 a week this year. The effort involves about 140 volunteers, 12 churches and four teams of workers. 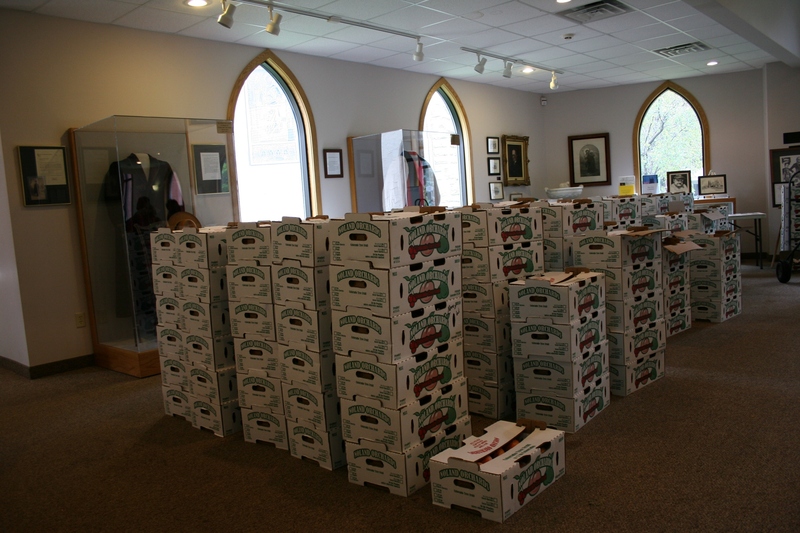 The Community Cathedral Cafe and First English Lutheran youth pre-sold 260 boxes of peaches and ordered an additional 60 to sell to walk-in customers. The peach project has been an ongoing fundraiser for around five years for the cafe and First English youth. About 50 boxes already had been picked up when I photographed this scene. But like any such organization, the cafe needs money to keep going. The peach project will channel funds into the cafe’s coffers and I’m happy to support the fundraiser by purchasing a $30 crate of fresh Colorado peaches. 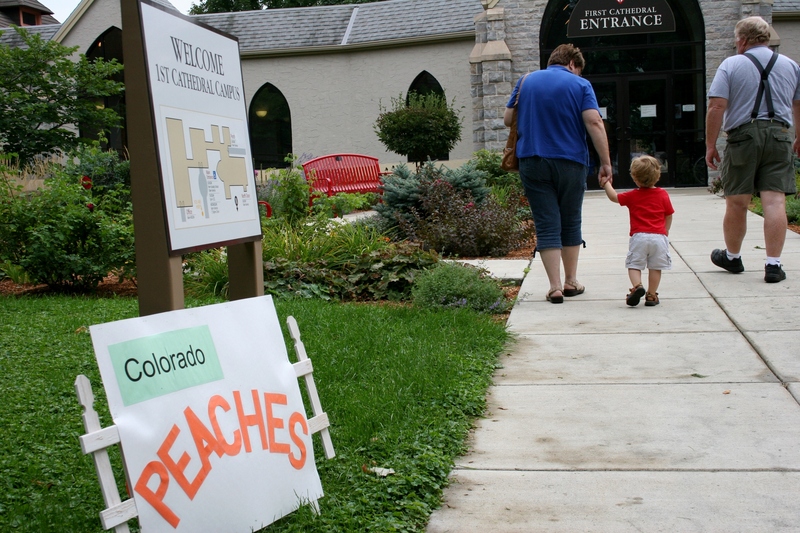 A sign outside the Cathedral Guild House directs customers to the peach pick-up point. Now, what to do with all those fresh peaches. Thus far I’ve eaten many straight from the box. One evening I blended a peach and vanilla ice cream into a smooth shake. This morning I sliced one into my oatmeal. And I’ve also used thinly-sliced peaches to make a ham and peach panini. I found the adapted sandwich recipe on Sue Ready’s blog and then tweaked it a bit. Spread mustard and 1/2 teaspoon honey on one bread slice. Top with ham, cheese and thin peach slices. Top with chopped basil. Place other piece of bread on top and brush lightly with olive oil. Also brush other bread slice with oil. Grill in frying pan until golden brown, flip and grill other side. Love, love, love this sandwich. My husband not so much. But he’s more an ordinary sandwich guy and I really had to persuade him to even take a bite. Now, I expect when I bake a peach crisp or a peach cheesecake later this week, he won’t hesitate to scoop up a sizable helping. 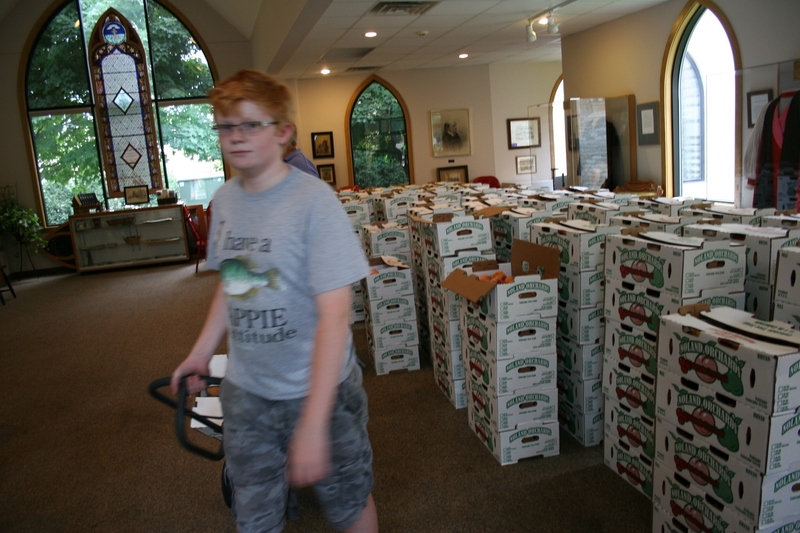 Tyler Welander, 14, who’s raising monies for youth activities at First English, delivers boxes of peaches to vehicles. I suggested to the peach sellers that perhaps they could bake the pies, too, for me to pick up. But one man said, “Oh, that would be down the street at Trinity.” And he would be right. The Trinity Piemakers are currently selling fresh peach, among other, pies. And since I attend Trinity, I can vouch for the delicious goodness of Trinity pies. 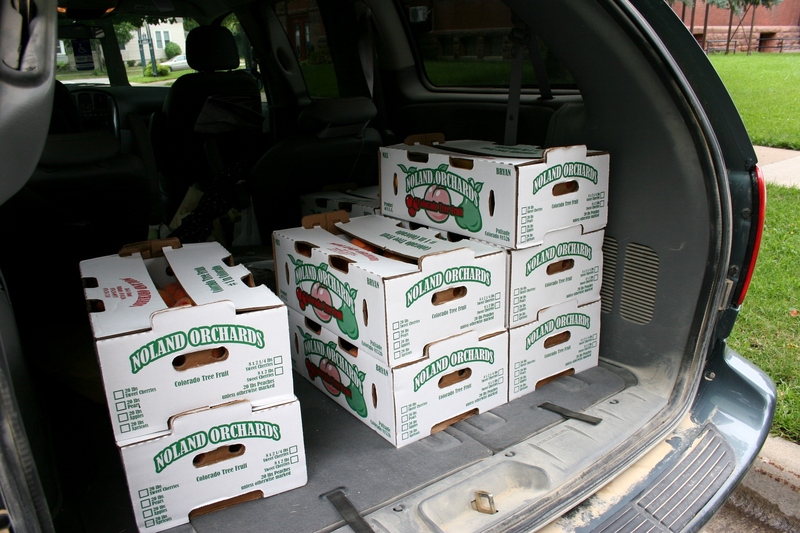 An elderly couple from Farmington ordered nine crates of peaches, seven of which they will deliver to friends. 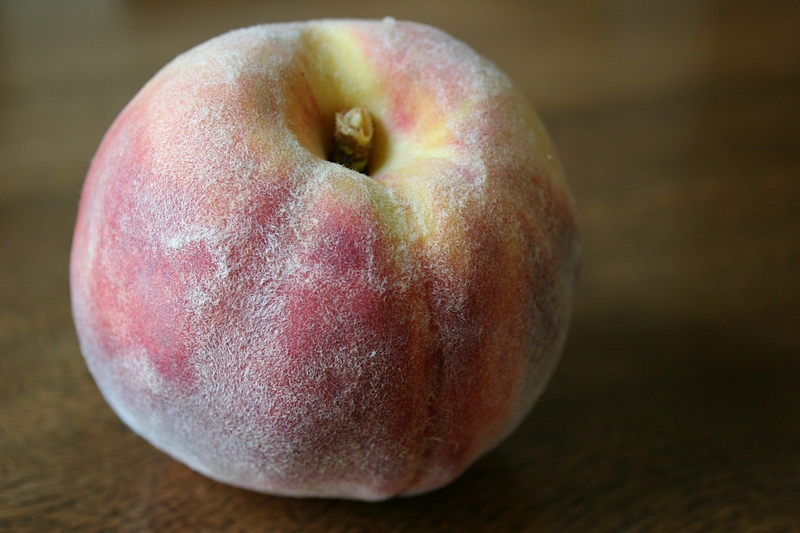 WHAT’S YOUR FAVORITE peach recipe and what’s the best way to freeze peaches? I’d like to hear. Click here to reach the website of the Cathedral of Our Merciful Saviour in Faribault, home to the community cafe. Also, please click here to read a post which features a poem I wrote about canning and the watercolor Zumbrota artist Connie Ludwig created based on my poem. Oh, how I wish “Pantry Jewels” was hanging on my dining room wall. 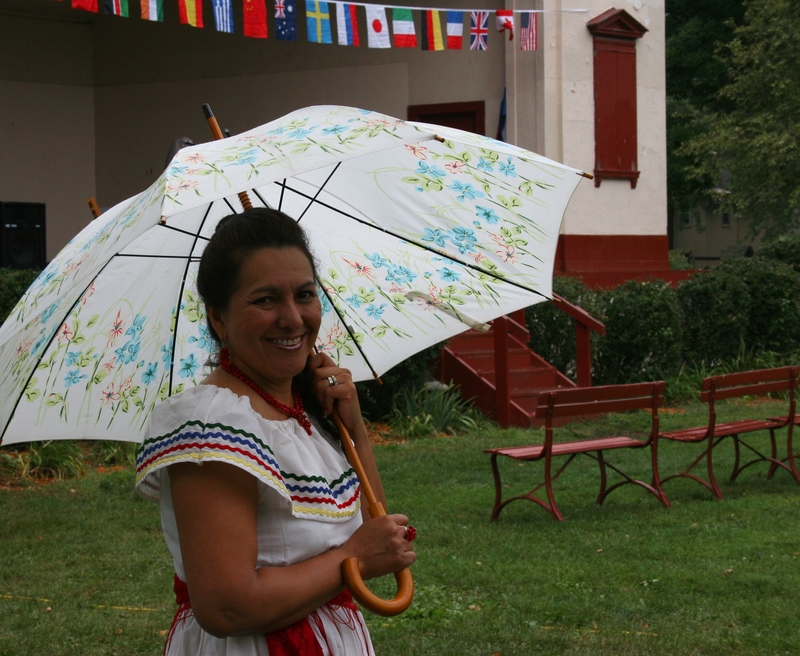 This woman represents El Salvador during the International Festival Faribault on a drizzly Saturday. Flags suspended from the Central Park band shell in the background show the countries participating in the event. 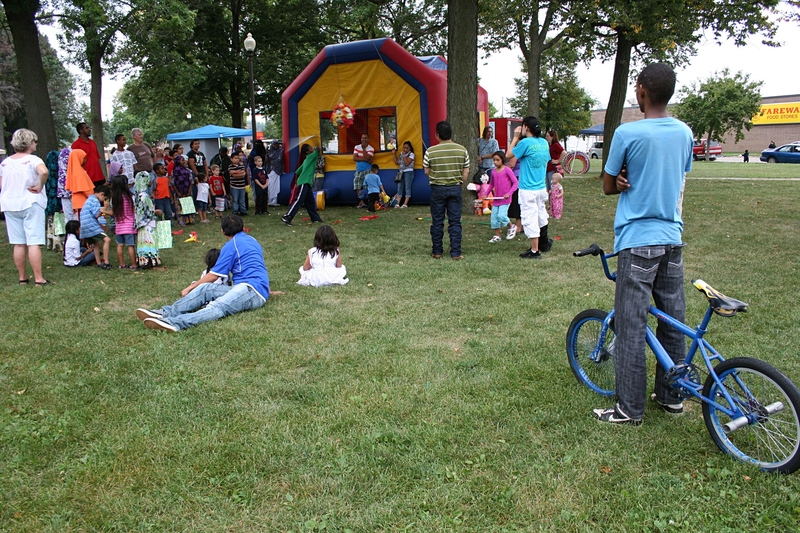 DESCRIBING AN EVENT like International Festival Faribault within the confines of a blog post or two seems daunting. 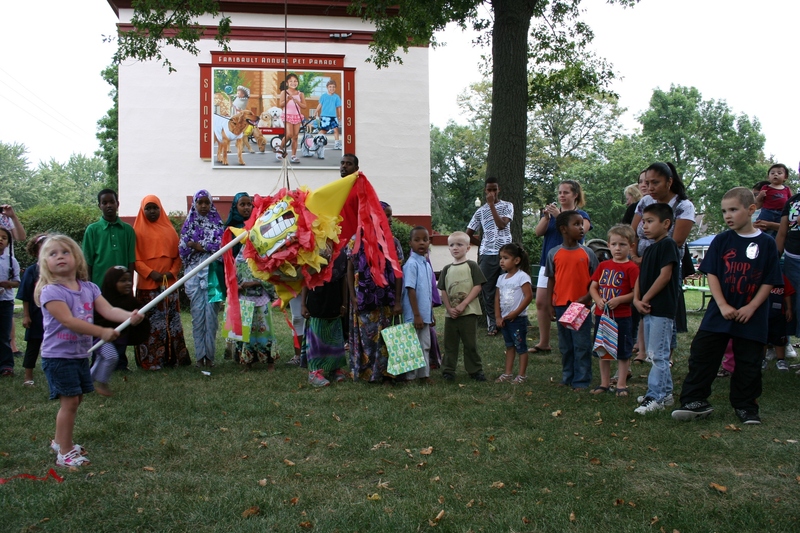 How do I adequately convey the essence of this fest celebrating the cultural diversity of my community? Now, as I scroll again through the many photos I took during the fest (when rain wasn’t drizzling upon my camera), I ponder which images to share, what words to pen. Cultures connecting on the band shell stage between musical acts. And “c” words—like color, connecting, communicating, conversation, coloring, candy, culture, care, colorful clothing—pop out at me as I view my photos. I should perhaps add “confusing” to that list because I felt overwhelmed when trying to photograph the wood carvings from Somalia and Kenya peddled by Bashir Omar and Asher Ali. A woman, without prompting, took this mask from the table manned by Bashir Omar and Asher Ali and asked me to photograph her. Suddenly, it seemed, everyone wanted to pose for a picture. And I much prefer candid to set up shots. I obliged, though, because it seemed the easiest thing to do. 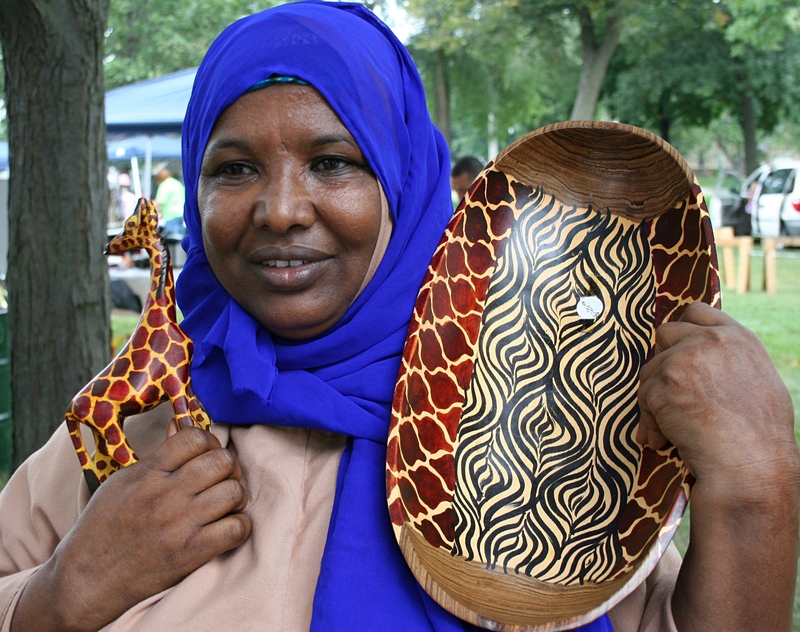 Lul Abdi shows off beautiful wood crafts from Kenya and Somalia. 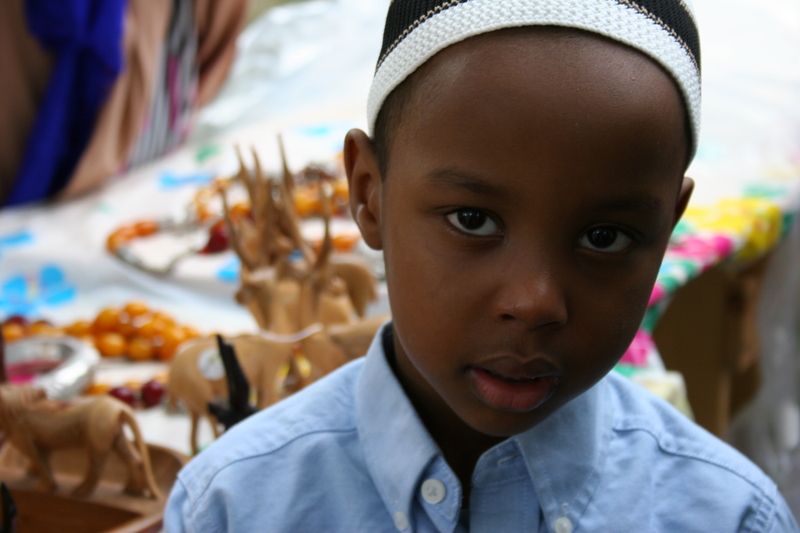 Then Lul Abdi, who had grabbed a wooden platter and giraffe, and held them up for me to photograph, asked me to write in my blog that an election is coming up in Somalia and I should tell everyone to vote for whomever it is she supports. Bashir Omar translated my answer—I don’t write about international political issues. While this back-and-forth translation was occurring, I felt befuddled because, when too much noise (in this instance lots of conversation going on around me and music in the background), is coming my way, my brain doesn’t process anything. That issue is related to the 70 percent hearing loss in my right ear. Despite the difficulties, this muddle served as an aha moment. Imagine if I was Lul, struggling on a daily basis to understand those around me. Life would be challenging. Busy artists at the kids’ activity table. But sometimes we all speak the same language. And I saw, rather than heard, that on Saturday, at the festival, especially among the children. They sat side-by-side painting at the kids’ activity table, bounced side-by-side in the bouncy tent, stood side-by-side in line to take turns swinging at pinatas. 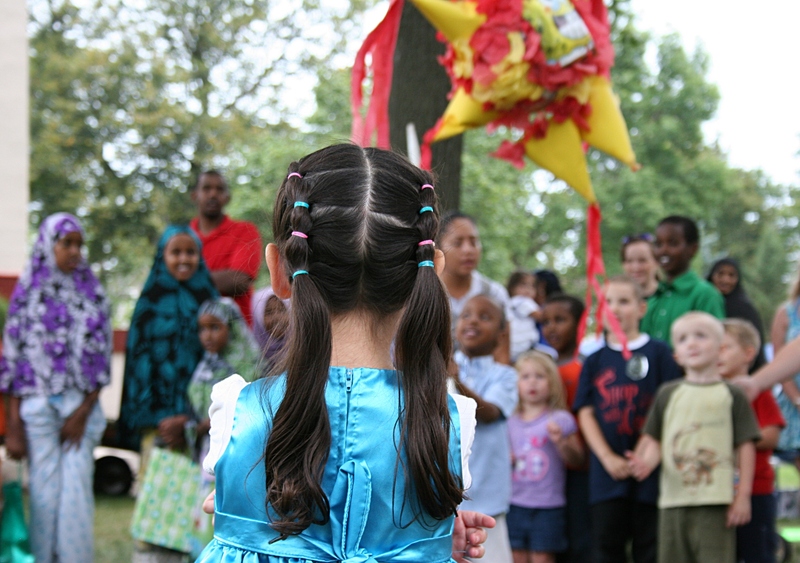 A little girl stands on the opposite side of the group of children waiting to swing at the pinata. Differences in color and culture and language mattered not to these children. They shouldn’t matter to any of us. Therein lies the message I most want to communicate to you today and which was communicated so well via International Festival Faribault. 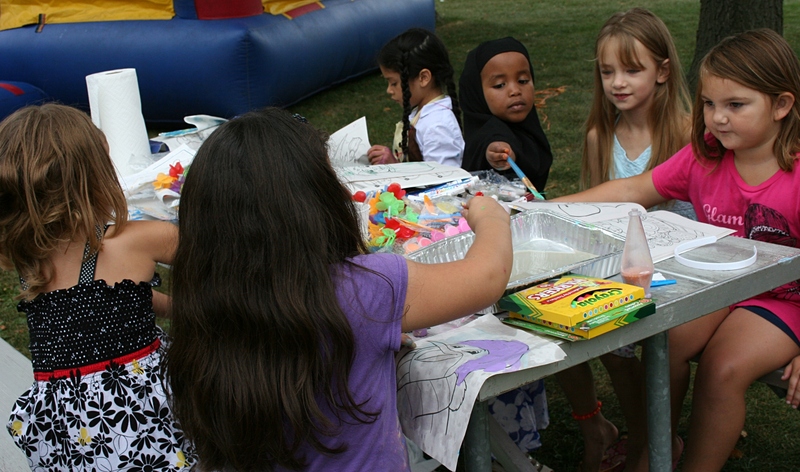 Happy children all focused on the same goal: breaking the pinata. All around me, children and adults of all colors mingled. The boy on the right was biking past Central Park and stopped to watch the activities at a distance. The scramble for candy once one of three pinatas is broken. 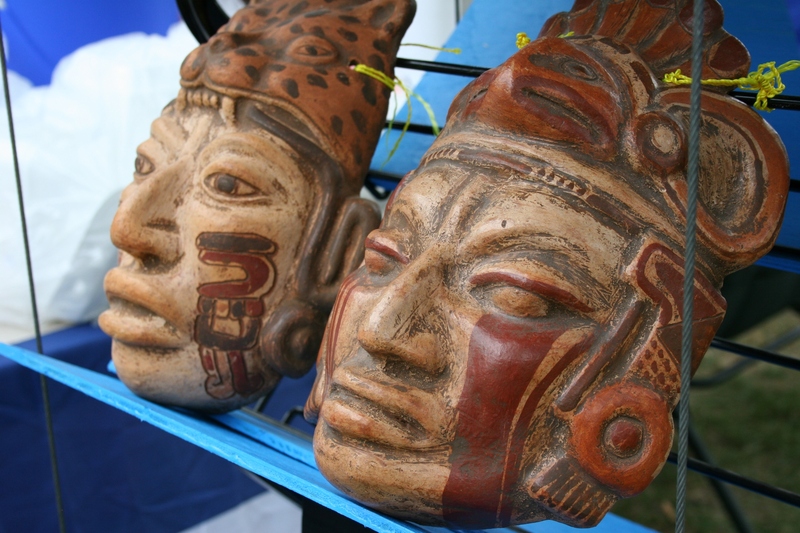 Masks displayed at the food vendor representing El Salvador. 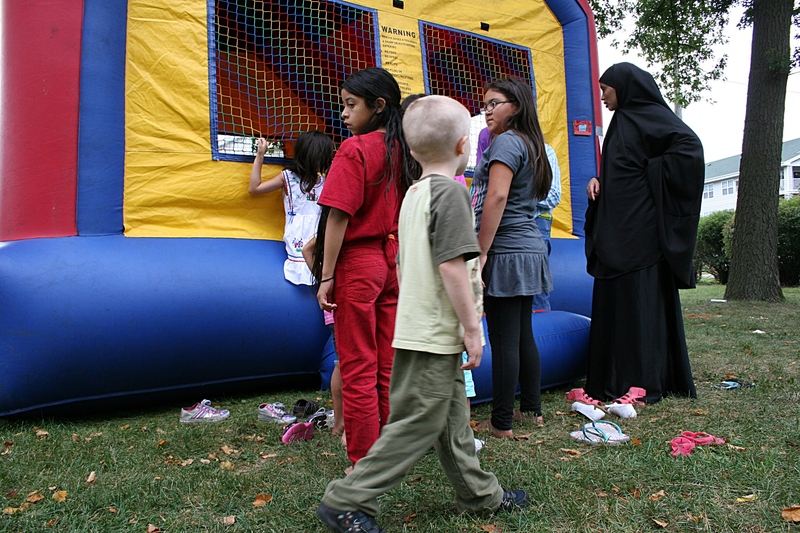 Waiting at the bouncy tent. 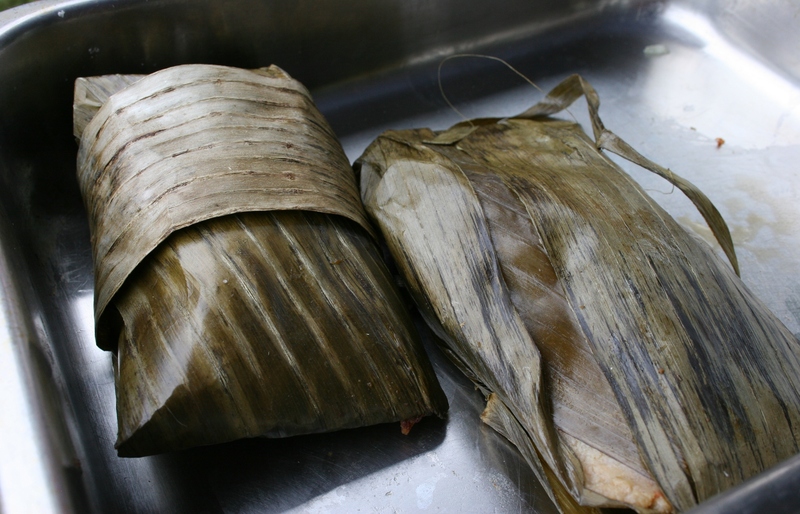 A Mexican dish (help me out if you know, but I think tortillas) was wrapped in banana leaves. My husband and I tried this. Conversation and connecting…, no other words necessary. 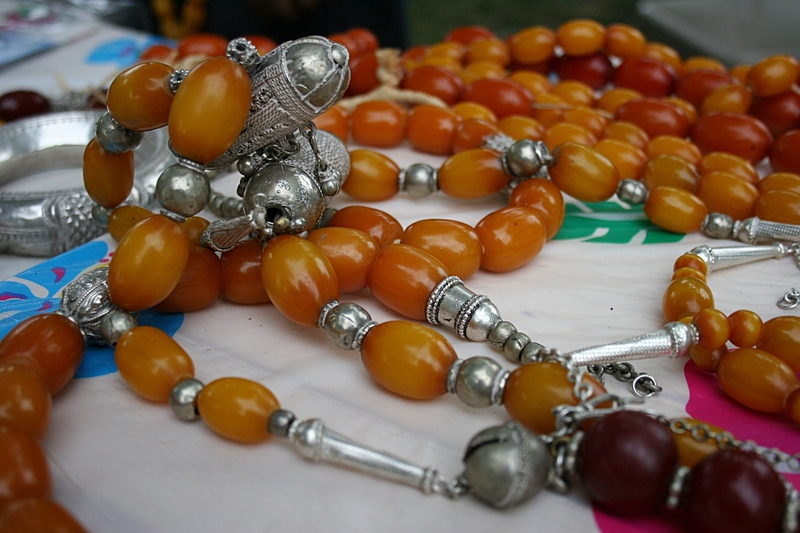 Necklaces and other jewelry from Kenya and/or Somalia and for sale at the festival. Kids painted and colored, etc., elbow to elbow at the always busy kids’ activity table. 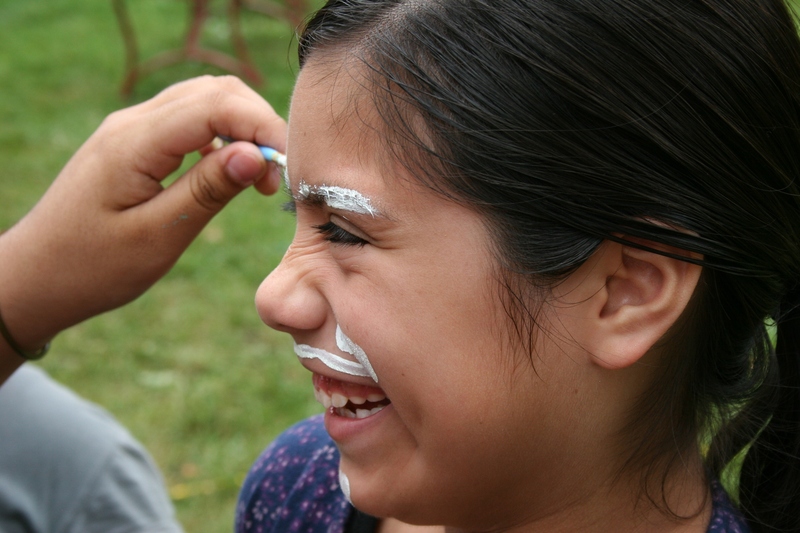 Some mischievous face painting was also part of the fun. BETWEEN NORTHWESTERN MINNESOTA and Chicago, you won’t find another art collection like the Gabor and Edith Nemeth Study Collection dating from the 15th to 19th centuries. Now that “Old Masters” collection of 42 European paintings owned by the Nemeth Art Center in Park Rapids is in need of a permanent storage unit to preserve the valued art for future generations. A campaign is currently underway to raise $1,200 for materials to construct a modular custom storage unit that will keep the paintings separated and vertical, thus preventing further damage. As of August 23, the NAC had raised $600 via an online campaign and direct contributions, according to NAC Executive Director Meredith Lynn. Brian Stieler of the Minneapolis Institute of Arts has volunteered to design and build the storage structure. And representatives of the Midwest Art Conservation Center in Minneapolis have already been to Park Rapids to assess the collection and lay out plans for restoration. “St. 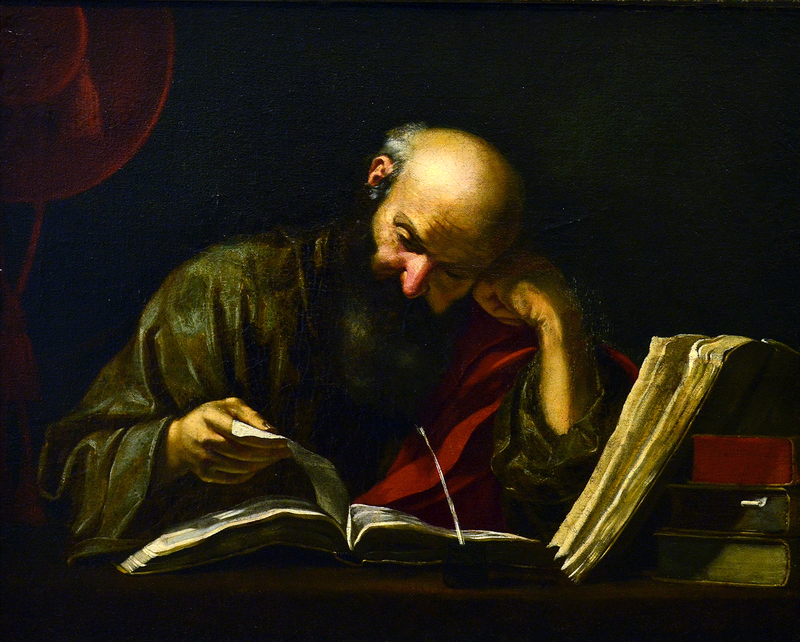 Jerome,” painted by a 17th century follower of Hendrik van Somer, and part of the collection. About a third of the paintings require restoration, Lynn says, with several in such condition that they can no longer be exhibited. More than 30 of the pieces are continually on display (during the center’s open months from May – September) in the 1900 Victorian style brick courthouse turned art center which opened in 1977. That was the year the historic and priceless collection of paintings, by students who studied well-known masters like Rembrandt, Rubens and Bosch, came to be owned by the then newly-established North Country Museum of Arts. European born art restorer and dealer Gabor Nemeth, who came to the U.S. in the 1940s and worked thereafter primarily in Los Angeles, also maintained a home in the Park Rapids area (his primary residence now) and brought his collection to Minnesota in the mid 1970s. After a three-day January 1977 exhibit of his collection in Park Rapids—a show which drew long lines of some 4,000 people total in the then town of 2,700, according to newspaper reports—Nemeth decided to offer the art to Park Rapids. Conjecture had long been that St. John’s University would be the recipient of the collection (for a reason unknown to Lynn; I asked). 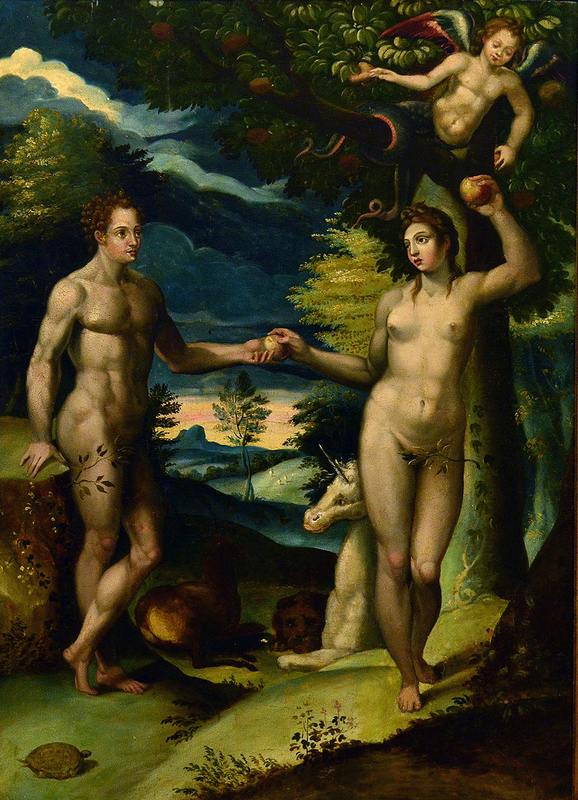 “Adam and Eve,” a 17th century painting by a student of Cornelisz. Clearly the people of Park Rapids realized the significance of Nemeth’s offer as 30 families borrowed $35,000 to purchase the paintings, a price “significantly less than the appraised value,” Lynn notes. The identities of whose who painted the pieces as part of a greater studio study setting are primarily lost to history, according to Lynn. Many of the paintings were originally acquired for Lois Warschaw, an art collector and prominent political figure in Los Angeles, prior to ownership by Gabor Nemeth and his wife, Edith. Today, as it always has, the Gabor and Edith Nemeth Study Collection centers the Nemeth Art Center, which opened in August 1977 after the Park Rapids community pulled together to purchase the paintings and remodel the courthouse into a center for the arts. New visitors to the Nemeth Art Center are always pleasantly surprised by the beauty and historical relevance of our paintings. Park Rapids is a small town, but the arts community here is growing and hopefully our collection will help raise awareness of the town as an arts destination. Today efforts also focus on preserving the collection via construction of the custom storage unit. With $600 more in contributions (as of August 23), the project can proceed. But the art center’s goals go well beyond a storage fix. Options are under consideration to move into a handicapped accessible building with more consistent climate control. The center is also working on a seven-year plan to restore the study collection paintings. The Nemeth Art Center is a unique institution, and this collection forms its backbone. Maintaining historic items is important and costly, and the NAC cannot provide the community with something so special without continued help. 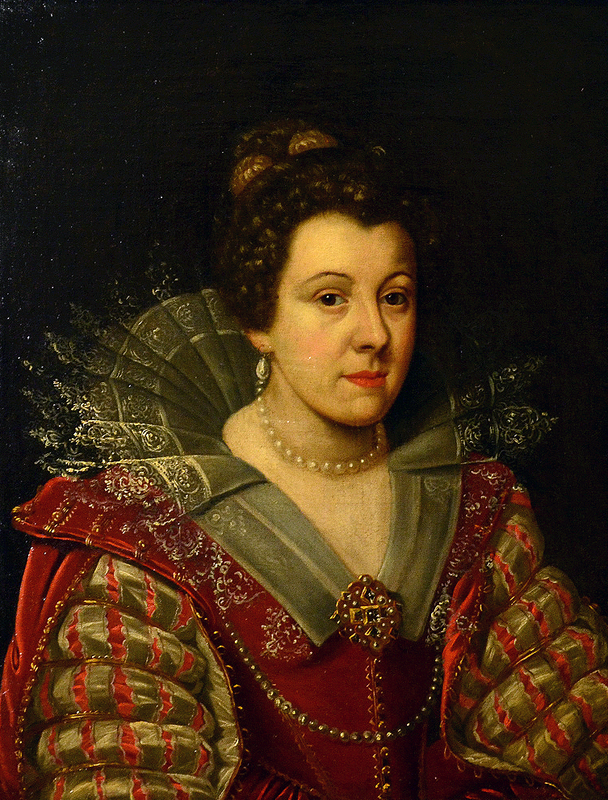 “Portrait of a Noblewoman,” an 18th century painting by a follower of Rubens. IF YOU’D LIKE to contribute to the storage unit fundraising effort, click here to reach the NAC storage unit project campaign on indiegogo. Or visit the NAC website, by clicking here, for details and contact information. To read a detailed history on The Gabor and Edith Nemeth Study Collection, click here to a presentation prepared by Steven R. Peterson with grant funding from the Region 2 Arts Council. Thanks to LouAnn Muhm, chairperson of the NAC Board of Directors, for directing me to this presentation, the source for some of the information cited in this post. Special thanks to NAC Executive Director Meredith Lynn for answering my lengthy list of questions via email. If you wish to view the Gabor and Edith Nemeth Study Collection, art center hours are from 10:30 a.m. – 4:30 p.m. Tuesday, Thursday and Saturday, May – September. Each month the NAC also features a curated exhibit of contemporary art in addition to pieces from its permanent collection. Finally, check out the current “Rembrandt in America” exhibit now showing at the Minneapolis Institute of Arts by clicking here. Perhaps viewing that will inspire you to support efforts to preserve the priceless paintings in Park Rapids. I HAVE PHOTOGRAPHED them from a distance, their long skirts swaying as they walk across Central Park toward me. Now the young women are standing before me and I am confused for a moment until Nasteho Farah tells me she wants to look her best and asks me to photograph them again. 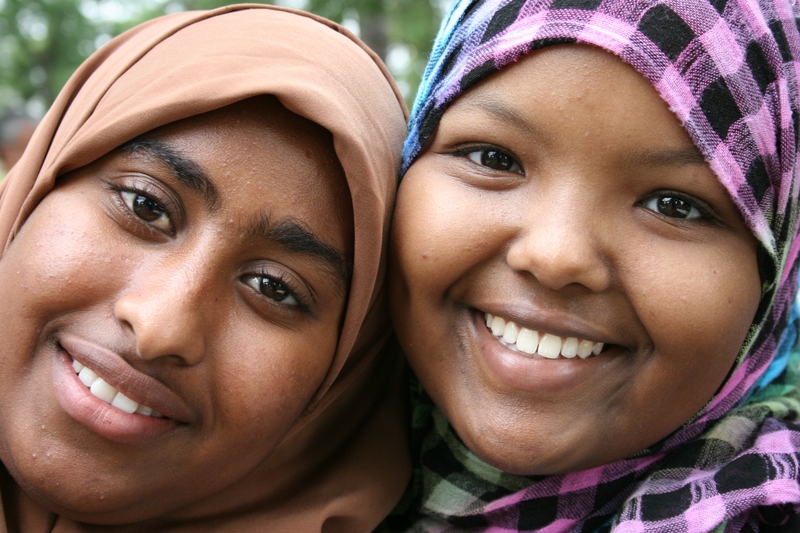 Friends, Nimo Abdi, a sophomore at Faribault High School, left, and Nasteho Farah, a senior. 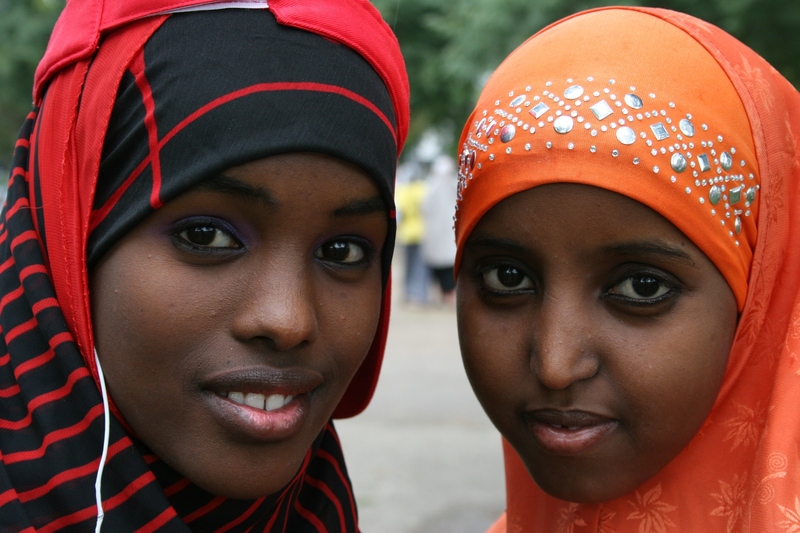 I agree as I already envision the portrait possibilities—the expressive brown eyes, the warm skin tone, the way Nimo Abdi leans toward her friend, her hijab brushing Nasteho’s cheek. They are beautiful young women and I take only one shot, knowing I’ve captured a memorable portrait. 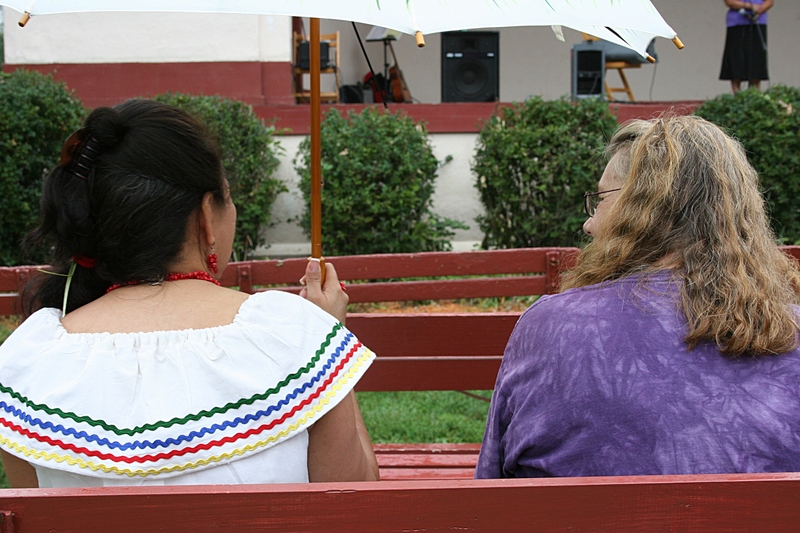 I love this image of a fest performer and her single audience member for the message it portrays– the one on one connection that helps us understand one another, no matter our culture or skin color. These Faribault High School students are among those participating in the International Festival Faribault on Saturday, an event designed to connect cultures through music, arts and crafts, kids’ activities, international cuisine, education and, on a personal level, conversation. 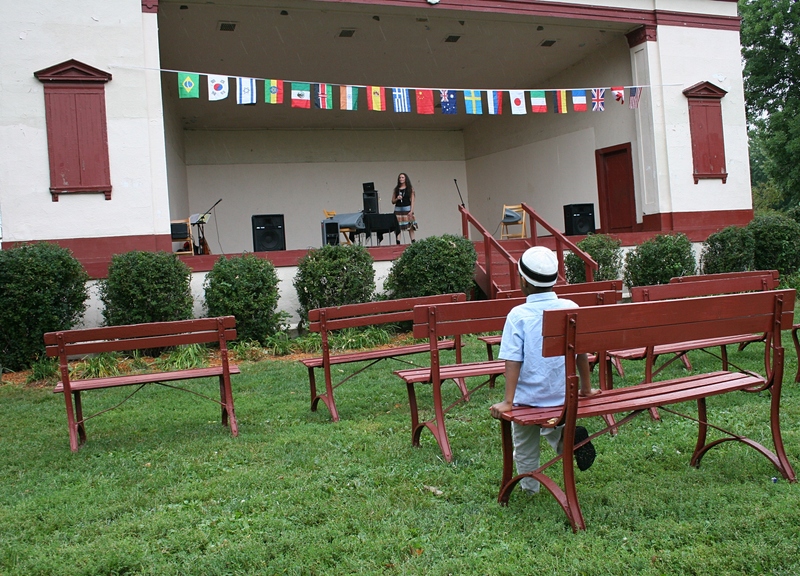 That same little boy who was so intently focused on the musician performing in the band shell. After I photograph the friends, we talk about their experiences living in Faribault. And what Nasteho shares with me so upsets me that I apologize to her for the utter disrespect shown to her and her friend, who stands silently listening. Her words temporarily stun me and I can feel my jaw drop. She doesn’t define “they” specifically, but says the insults, the prejudice, happens randomly—in school, in the streets, even at work. 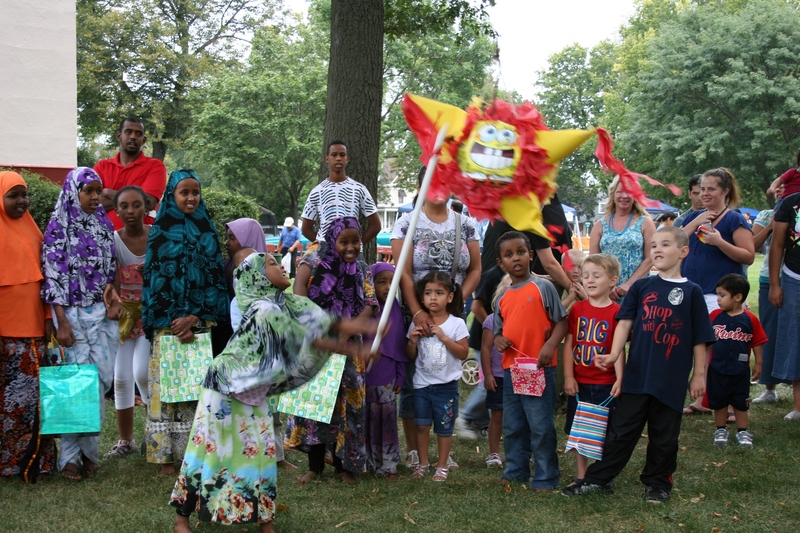 A group of young Somali dancers perform on the band shell stage during the festival. When I ask for examples, Nasteho mentions the middle-aged man who comes through the drive-through at McDonalds in Faribault where she works. He tells her she should stop wearing her head scarf. She’s talked to her manager about it and he’s been supportive. For now, she mostly tries to ignore the customer’s spiteful comments. When she walks into other businesses, like the grocery store, she feels the stares. When driving, she’s been flipped off. 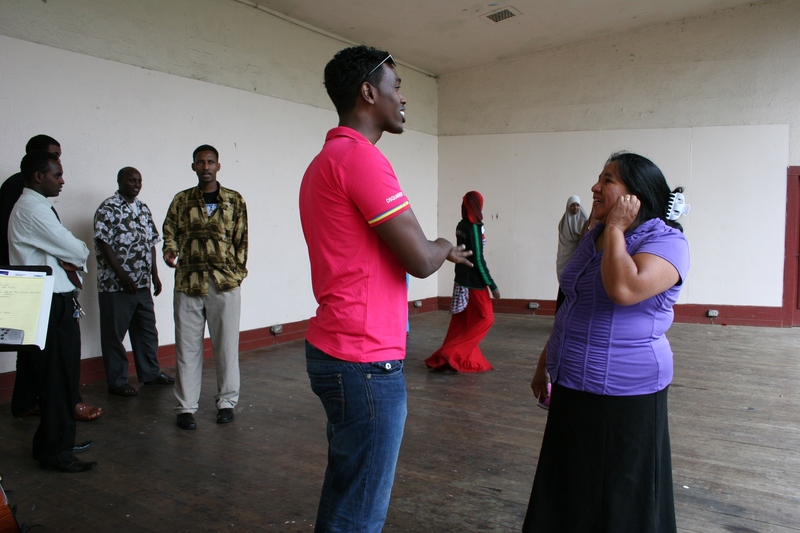 “There is no respect for Somalis,” Nasteho assesses. Yet, she doesn’t seem visibly angry, choosing instead to speak up or to take the position that those who choose to attack her or her culture do not know her or understand her. I admire Nasteho’s positive attitude. She tells me she didn’t experience prejudice living in Rochester—a larger and more diverse community—but that it’s been much harder in a smaller town like Faribault. 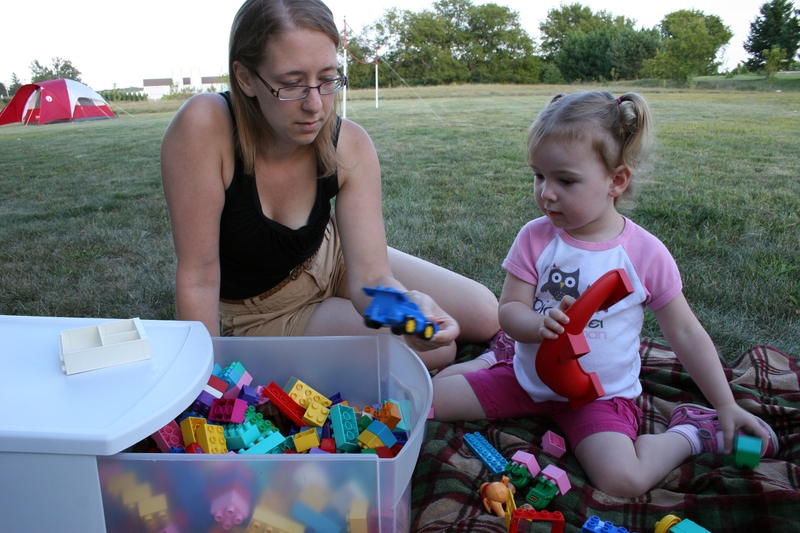 She was too young to remember what life was like in Owatonna or Waseca. Faribault High School seniors Shukri Aden, left, and Khadra Muhumed. 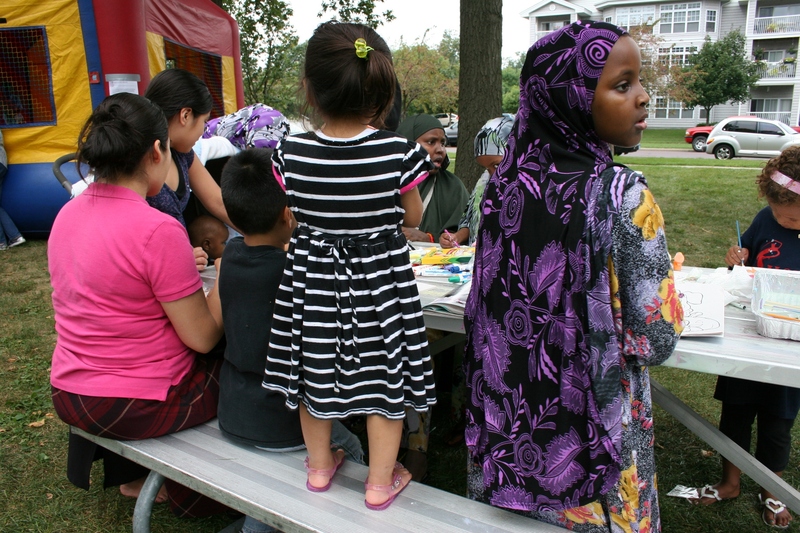 Faribault High School students Shukri Aden and Khadra Muhumed, who are volunteering with STOPS, Students Together Offering Peer Support, at the International Festival, have also been subjected to hurtful comments from those who tell them to go back to their own country or that they smell. 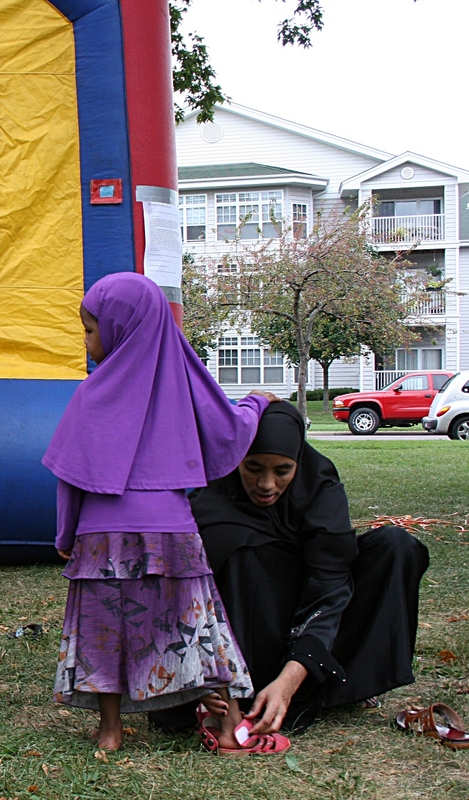 “I try to talk to them,” says Shukri, who has lived in Faribault for seven years, since she came to the U.S. at age 12. 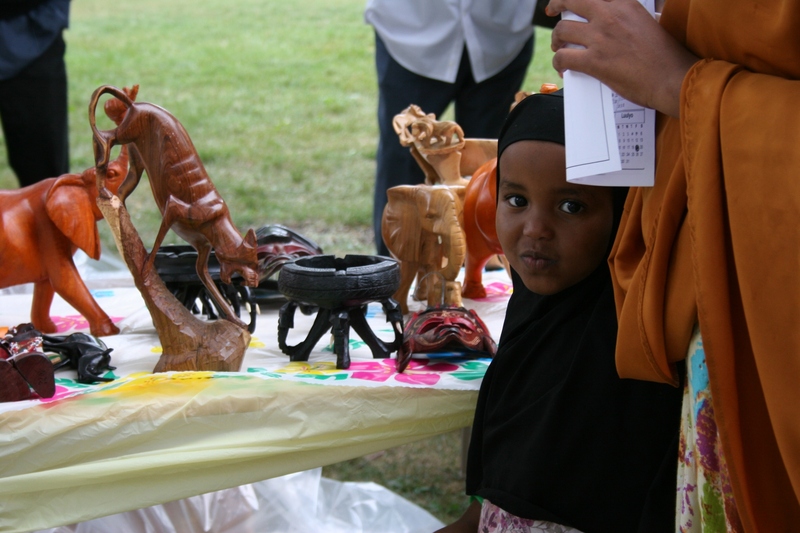 Lul Abdi shows off beautiful wood crafts from Kenya and Somalia for sale at the fest. And this FHS senior has dreams—of going to college to become a nurse and then returning to Somali to help those in need. 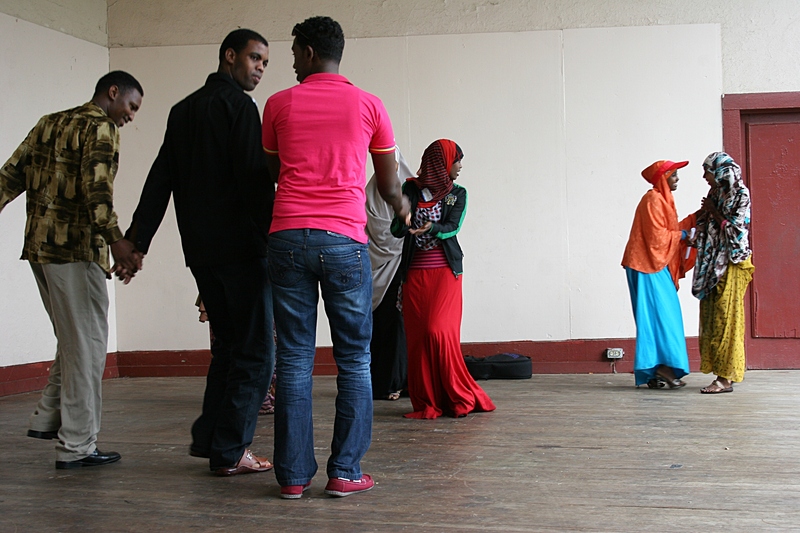 On this Saturday, at this International Festival, the words of these young Somali women evoke mixed emotions within me. I am saddened by those in my community who fail to see beyond the scarves, the culture, the skin color, the language. Mother and daughter check out the artwork from Kenya and Somalia. These women are not terrorists. They are someone’s daughters. They are high school students. They live here, work here, shop here, worship here. Despite the clear prejudice which angers me, I feel hope. These young women possess a maturity and poise beyond their teenage years. They yearn for understanding, for respect, for the personal connections that define them as individuals. A mother’s love and care, the same in any language, any culture, any skin color. 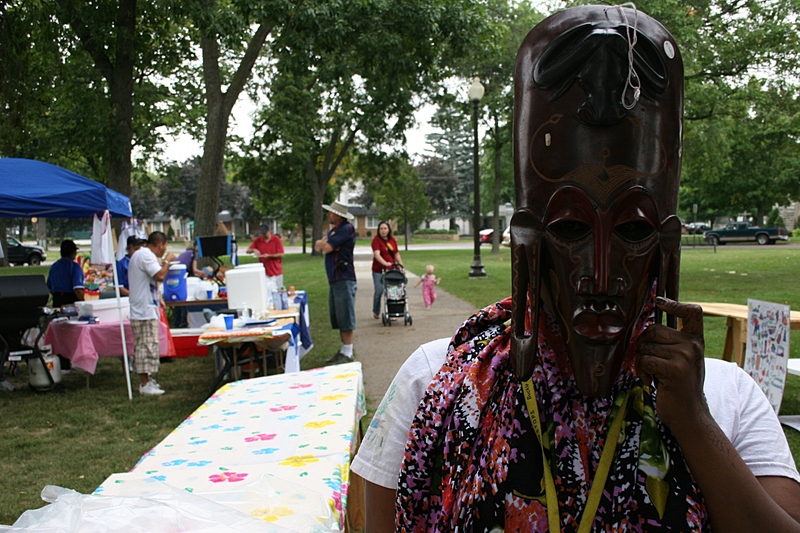 CHECK BACK FOR A FUTURE post with photos from the seventh annual International Festival Faribault. 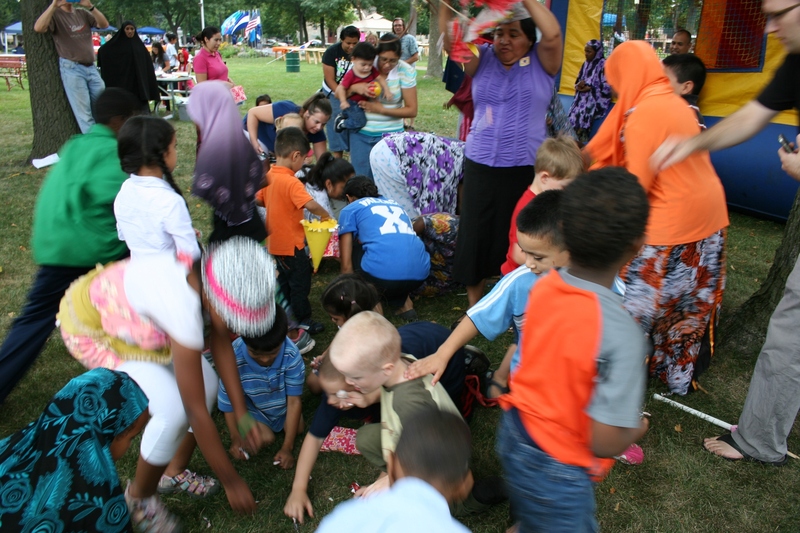 Thank you to the organizers and participants in this festival who are trying to connect cultures, to make Faribault a better place to live, no matter your culture, skin color or country of origin. MY HUSBAND AND I recently traveled to Santiago. Not Chile. Minnesota. 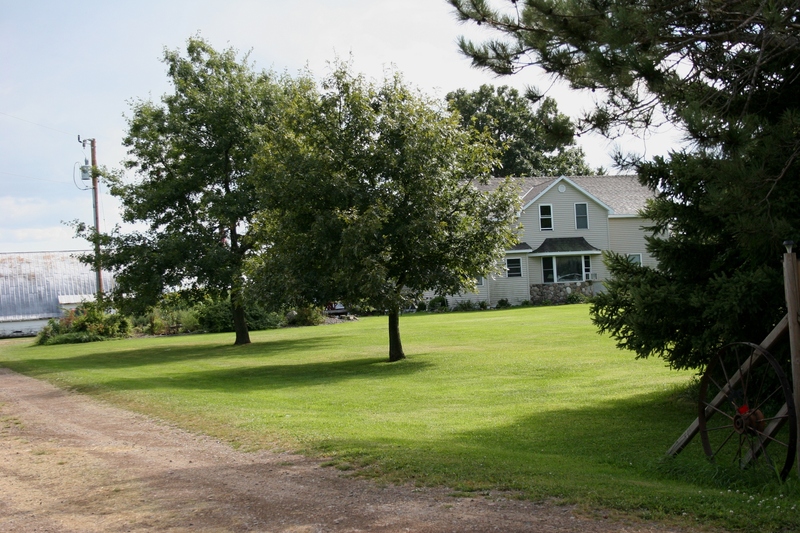 There we gathered on a 2 ½-acre parcel of land in Sherburne County northeast of Becker to reconnect with family for what will become an annual summer reunion of the Tom and Betty Helbling family. The rural Buckman home where my husband grew up after his family moved from St. Anthony, N. D. The farm place was sold after Randy’s mother died and his father remarried. We drove past the home place en route to the reunion last Saturday. 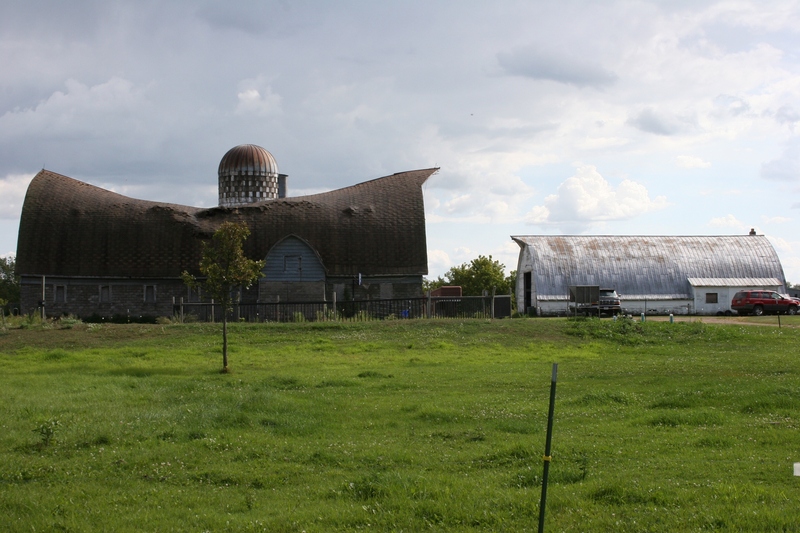 It’s changed with the house resided, the barn roof sagging. Betty, my husband’s mother, died nearly 19 years ago at the age of 59. And, as anyone who has lost a mother too early in life knows, maintaining family ties after that takes extra effort. Thanks mostly to Randy’s sisters, his family (seven remaining siblings and their families and his dad and stepmother) has continued to gather each Christmas as able. My eldest daughter, Amber, and great niece, Meghan. Some family members slept in tents, others inside the house and yet others were close enough to drive home and return the next morning. Three extended family members also traveled from Center City, North Dakota, for the reunion. But, as years passed and nieces and nephews married and had children, the family has reached a size where we can no longer all fit under one roof on a snowy Minnesota holiday. Thus the shift was made, just this year, to a summer reunion. It’s a good change—no more worrying about snowstorms or icy roads—which should allow others, besides those with big enough houses, to host the reunion. Randy and I will take our turn eventually, but perhaps not for awhile as the reunion likely will fall on the same date as the son’s college move-in, like it did this year. And activities and noise will be more limited by our location on a small lot in a small city with neighbors right next door. 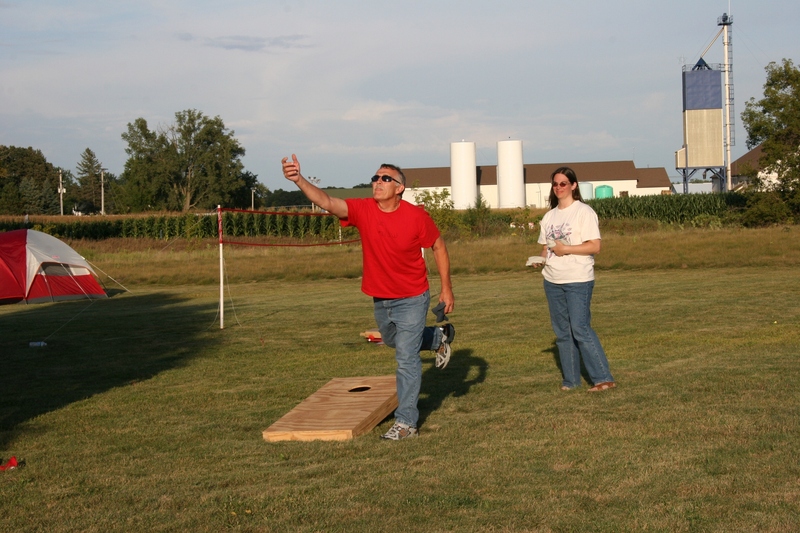 My brother-in-law, Jerry (in his out-law t-shirt), and my nephew’s wife, Heidi, tossed bean bags after supper. Niece Kristina and Corey hosted this year’s gathering on a picture perfect Saturday, except for evening rainfall which forced us into the garage. But there were no complaints about the much-needed moisture. 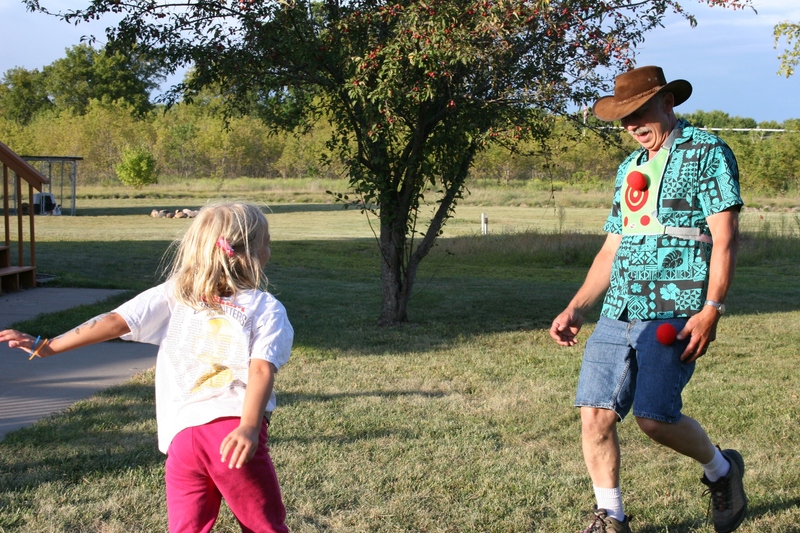 My brother-in-law, Roger, is a the target for balls aimed by his granddaughter, Kiera. 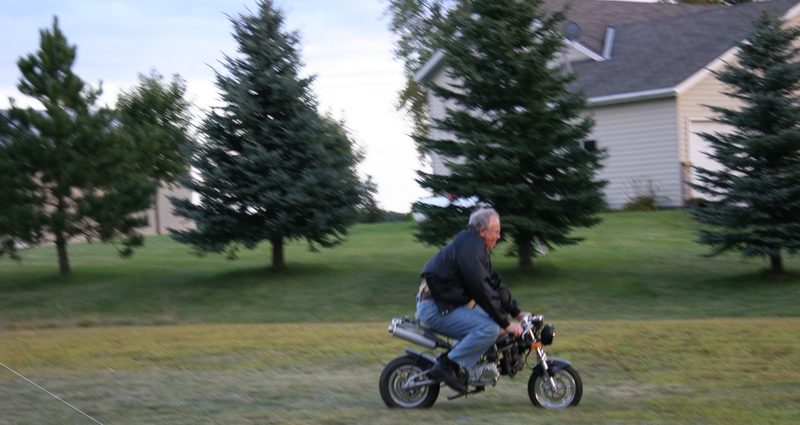 My brother-in-law, Marty, took a spin on the bike and wiped out before I ran in the house and grabbed my camera. Instead, there was laughter and reminiscing; plenty of smart talk; memories shared and made; quick zips around the yard on a mini motorcycle; bean bag tossing; ball throwing to the dogs and at grandpa; LEGO building; and cuddling the newest family member, three-week-old Kate. And then the announcement: We’ll gain more family members in 2013 with the expected birth of two babies, plus the baby due in November of this year. 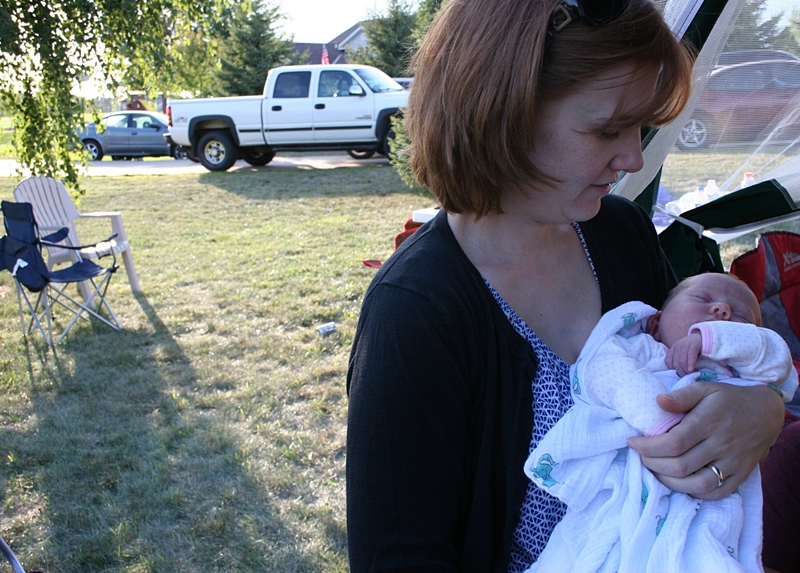 My niece, Jocelyn, with her three-week-old daughter Kate, the newest member of the Helbling family. My mother-in-law Betty would be happy, oh, so happy to know her family is still growing and still gathering. 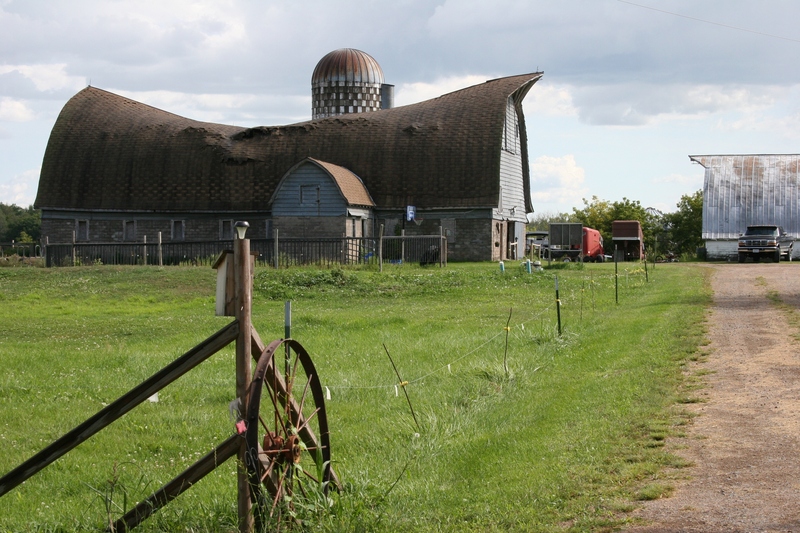 So sad to see the barn caving in on the former Helbling farm south of Buckman. I have many wonderful memories of family gatherings at the Helbling home place.